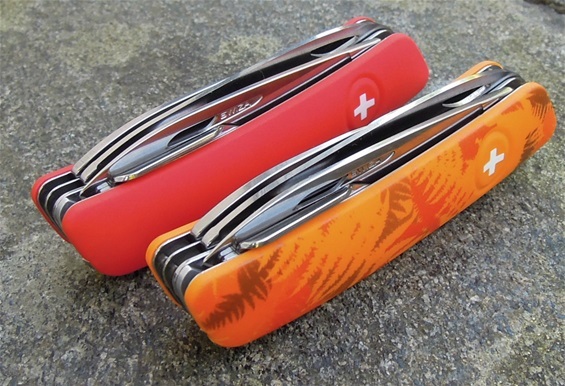 Now it is time for a Swiza knife that is a world of cool. It is the C06 that got the same tool configuration as the D06. They also got tweezers both. The C06 is the Filix orange design. Handle designs are something I have researched for many years and I have done a lot of study on ergonomics too. The use of decorations, camo systems and designs are very important for the appearance. Wenger for example was a company that incorporated a lot of systems in history. For me the different designs can show just how versatile knives are. It can just as well fit hunting, hiking, camping or sports. By using variations on the handle colors and decorations it is possible to have a greater relation for the specific personalized need. The color is easy to see and therefore easy to see if dropped.. In the history of SAKs the use of handle designs was and is used to better identify the SAK to a personal interest, sport, job or hobby. Orange are many times used to make it easier to find if dropped for people and hide it from the color blind eyes of deer like the Ap Blaze Wenger used. I really like the use of a big number of handle variations. The handle design on the construction itself on the Swiza is very well thought through. The soft touch material is versatile for a number of colors, decorations and camo designs. The only problem with the design on the C06 is that it is difficult to picture. They are best in the hand. The C06 is another fresh model with the newly incorporated saw. There are several models with the Filix designation. The orange is bright and nice! I am looking forward to the Swiza future! "The design helps for using it in both directions. Avoids getting stuck and best comfort on several materials"
The traditional slip-joint mechanism works very well and the D06 and C06 got strong springs. 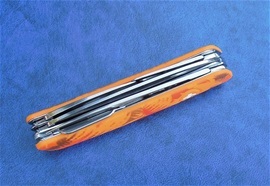 The functions are very easy to open and close. The knife blade is the only function with a locking mechanism. There is no need for any lock for the saw because correct motion will prevent any accidental closing. The length of the Swiza saw is enough for many tasks. Because it is thicker and with the extra width you get a more stable experience using it compared to traditional ones like the 84, 85 and 91mm traditional ones just to mention a few. It is always very difficult to compare any other ones to the 111mm and 130mm saw. 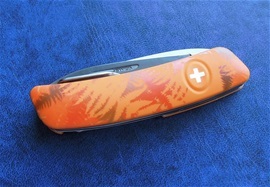 The type used on the New Ranger knives from Wenger did set a standard that is hard to follow. There is flexibility in the Swiza saw and you actually get a good length compared to several multi-tools of the world. This one is stable and it is solid made like I already have mentioned. That said I am very glad to see this saw because of its special design that is so very different from what is the usual ones. It is nice to see fresh designs and it is therefore extra fun when it works so well. The ergonomics and design of the handle could not be better when using the saw. It allows some extra pressure to be applied. It is also smart to remember that a thicker saw is a bit slower and it is important to have a firm grip. The extra solid construction and design of it require some extra force when you need to cut something fast. I have used pretty much all types of SAK types over the years and I learned very fast that it is no point of using too much force, it is absolutely not necessary to use body strength like many unexperienced users do. It is about practice and how you place or position yourself and the item that is to be cut. 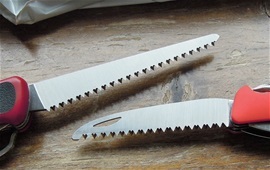 It is important to remove dirt and substances as you go from the saw for the best functionality. I recommend this one because it will do outdoors, garden and sports tasks very well. Compared to the Wenger New Ranger saw it is thicker too so it is a sturdy design. Some prefer more flexible and thinner types because it is with less effort cut materials. The drawback is that less sturdy designs can flex too much and disrupt the motion. It is all about practice. Compared to traditional SAK types this is a beast. The Wenger New Ranger saw i have used and tested for years. It is a shocking good quality. The design of the Swiza saw is made with all the correct features to prevent it from pinching and getting stuck. The grind and cut of the teeth helps using it in all directions. When I tested this saw it helped to remove dirt from the cut track by itself to a degree. The saw when in open position is held in place by the slip-joint spring and the design of the tang vs. the spring is specially designed for secure use without any lock. 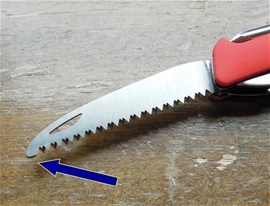 The angle of the saw from the handle is downwards and this helps for the ergonomics in the hand when using it. It also prevents accidental closing and helps to apply pressure in the correct angle. "I am very glad that the steel used in the knife blade got a very good bite in wood and other materials. There is a great advantage with versatile knives because you can have other functions that can relieve the knife blade from the hardest tasks. The steel used in the knife and the design of it is a sturdy one. The awl can be used to make holes in materials and therefore you can save the tip of the knife. It is fully possible to use the tip on materials. For outdoors use you can get a safer philosophy by taking advantage of the saw, awl and knife blade better"
The tip section of the saw is not designed for hollowing materials. This type of design is used on several SAKs. Some designs on SAKs do have a tip that is designed for hollowing materials. The types that can be used for hollowing materials got the cut grind teeth lower. While the Swiza type got the same level on the grind and tip. The front or tip section of the saw is also the rest for this function when closed. When you use the saw cutting braches, planks or materials the tip section secures the range of motion. It helps to hold the saw into the materials without slipping outside. The types with designed to hollow can be a bit different for some. It can fall outside the range of motion for unexperienced people. I like both designs. From before i have used and tested for my personal experience the awl used on the Swiza knives. If you take a look to the left on my pages you can see some of the models. So far I have placed this awl to be used best on materials that are not very hard. 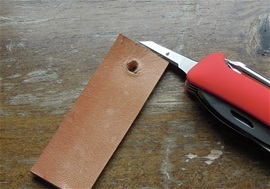 It is nice for leather, fabrics and some push in wood to make a starter hole for example. If you use it on wood I recommend using some care. I would prefer the awl to be made a bit more heavy duty so it can save the tip of the knife blade from harder tasks. Swiza use a very good selection of stainless steel with 57HRC for the knife blade with a very good bite. If I should make some recommendation for Swiza it would be making a heavy duty awl for drilling tough materials. I would also like a bit more heavy duty flat screwdriver with the cap opener and wire tool. This Brand got heavy knowledge and experience from the former Wenger Company and I know it will be fun to follow the future. Leather is a very versatile material. The awl can be used to drill in such materials. This you do by piercing into a depth you want and drill to secure a good result. The combination reamer/awl and saw is very good for survival and outdoors tasks. On SAKs for example you can find similar ones used on the alox line 93mm. it is not completely the same because the 93mm alox ones can drill tougher materials. Some even use them for drilling in wood. The Swiza reamer/awl is not completely as sturdy yet as the 93mm Alox and SI ones. It does pierce very well and when into a certain depth you can safely drill with this. Typically the ones used on 84, 85 and 91mm SAKs got a different configuration for drilling that secures the tip from damage better. With a few adjustments on this then it will be heavy duty. That said it all depends on Company Philosophy because this will work well on leather, fabrics and some wood. Typically an awl will indent into a material making a starter area for a screw or such. I feel on such knives or SAK similarities that the awl should have further abilities. The edge on this awl is very sharp and that is a big plus! The eye can be used to sew with. 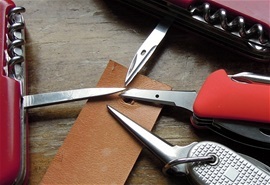 Leather can be used for hinges, belts and hundreds of other tasks. The typical Wenger design on the 85mm was a device called reamer, awl and puncturing device depending on user. 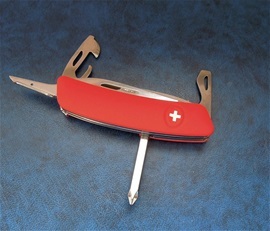 The one used on the Victorinox Soldier, Alox and Wenger Si after 1961 is the type with drilling abilities. The typical Victorinox reamer/awl is used after 1961 on 84, 91, 111mm and more with abilities for sewing, puncturing, piercing and drilling all at some degree. The piercing and sharpness of the Swiza design is very well. It follows the piercing philosophy used by the former Wenger with some similarities in design like the Si type. It got an edge and this can be taken advantage of. In a way it is a second blade too. Just remember that when you drill, puncture, indent or pierce that the tip section of this could be made stronger. In the history of SAKs it is important to remember that some functions are made for precision tasks and for delicate tasks. My personal philosophy is that the awl, saw and knife blade are linked together for combinations to relieve and fulfill each other. Typically field chores for the awl is to be used to pierce, drill, and puncture and to save the tip of the knife blade in several ways. It can be in an emergency to avoid damaging the knife blade tip, prevent it from getting dull and also to prevent dangerous use of a blade. My philosophy is always to avoid pressing the tip of a knife into a material. 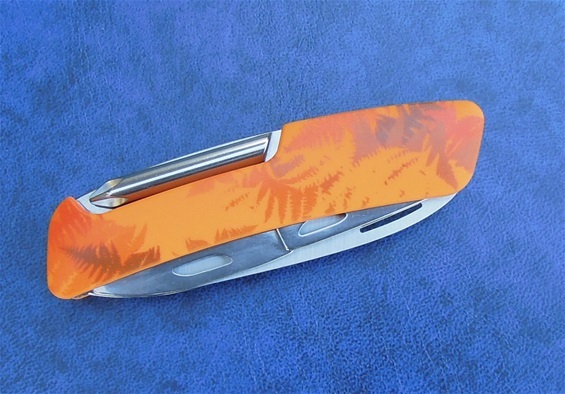 This is because it is a folding knife; it does have a locking mechanism for this to avoid accidental closing. It is a bit extra sturdy as well. For me it is just so. Typically the awl can be used for sewing sacks, sails and to be used for sewing leather items. It is also nice for repairs on several other materials. These factors mentioned today are some of the reasons for why we have several SAK designs and philosophies. This is part of making it so fun and interesting to study them as well. I love it! Because this awl is so sharp and able to pierce it is not necessary to use force and therefor you avoid damage to the function. It is about using it correct. Still I would prefer it to be made more heavy duty and therefore it will be able to fulfill and relieve the knife better.